It sounds a bit gross to use crushed bones when fertilizing, but the fine, powdery substance works wonders for your plants. Bone meal is a great source of phosphorus which helps establish good roots, and without good roots, plants don’t grow as well. Bulbs, like the ones in my photo here, will appreciate some bone meal mixed into the planting soil. 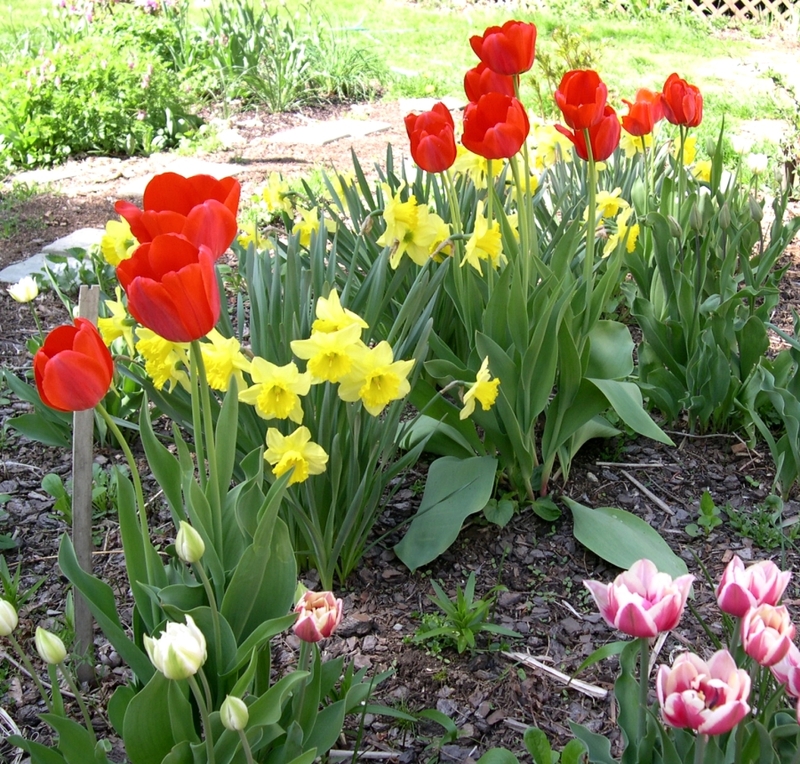 Your tulips and daffodils will produce more blooms, as will any flowers planted in spring. Organic Bone Meal is the perfect addition to an organic garden. I add it to the bare garden soil in spring before it’s time to plant. It helps make the soil better for everything you plan to grow, as long as you don’t overdo it. Use it as a soil amendment around perennials too. I sprinkle it around the hydrangea shrub and other perennials in the yard once the snow is gone. Rake it into the soil and be careful around the shallow roots. Bone meal replaces depleted phosphorus and will get the plants off to a good start for summer growth. I buy mine in 4.5 lb. bags and directions say to use 1 teaspoon mixed into the dirt for bulbs. For shrubs, such as the hydrangea, apply 1 to 2 pounds (2.25 cups of bone meal equals 1 pound). Directions are on the bag, or box and it can even be used in pots. Blood meal is a different product and can be used to supply the nitrogen your garden needs. Nitrogen keeps plants looking green. Use it if the leaves on your plants begin to turn yellow. Be careful when using fertilizer, even organic fertilizer (and make sure it is truly organic!) like bone meal and blood meal, because it is still possible to use too much and damage the plants. Annuals and Perennials will grow better with bone meal. Above you can see the lush growth of my nasturtiums (annuals), and hydrangea (leaves) and coneflower (echinacea) which are perennials. Next Post What Flowers Will Kate Carry Down The Aisle? I’m no expert, but bone meal can be applied any time, since it mainly helps the root systems – to the best of my knowledge. Blood meal is something I know less about, but read the package to find out more. A very good site. Lots of good information.